Wondering what to do on a lazy Sunday? 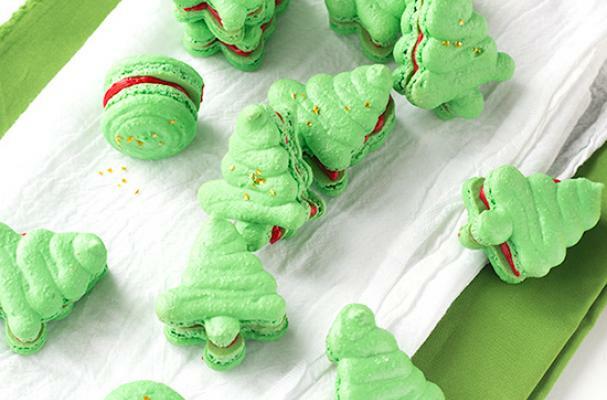 Make Christmas macarons! It’s day 3 of “THE 12 DAYS OF CHRISTMAS COOKIES” and today I’m featuring these simply gorgeous French macarons from Cookie Dough and Oven Mitt. Her delicate green Christmas trees are filled with a vibrant red vanilla frosting making them almost too pretty to eat! Put them into pretty jars with a festive ribbon tied around the rim of the lid or wrap them up in holiday cellophane baggies to give as gifts. And, oh joy!, they’re gluten free too! Let’s get baking, friends! Don't miss Day 1's Speculoos: Traditional Belgian Spiced Cookies and Day 2's 3 Festive Chocolate Bark Recipes You’ll Want to Make this Holiday Season. Print out 2 copies of the Christmas tree template here. Line a baking sheet with parchment paper. Line the two templates up underneath of the parchment paper. Place frosting in a piping bag with a small tip, such as a #7 Wilton tip.